I love you despite your ability to make a king sized bed feel small. I love you despite your insistence on leaving warm stinky treats in the kitchen on rainy (...and other) mornings. I love you despite the fact that you insist on howling and waking the babies from their naps because someone closed their car door four houses down. I love you despite your uncanny knack for convincing people (myself included) to give you their food ...only to puke it up on my living room sofa moments later. I love you even though you scratch me with your sharp little talons; no matter how short they're clipped. I love you despite the fact that you drive me crazy. I love you because you were my first baby. And you're perfect. Great pic, reminds me of Einstein. That's so sweet. 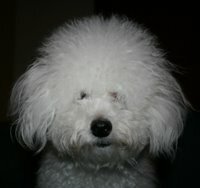 If I didn't know better I'd think you were describing my bichon Bianca, who in addition to pulling off all the shenanigans you've described here, was also an expert at chewing on everything within reach. But I loved her to death. She was my soulmate. I think Izzy knows you're blogging about her from that cute little "who me?" expresion. I hope your sofa is leather, something easily cleaned, lol. Bloggy Bling at my place for you. What an adorable picture! I love that she makes a king size bed feel small. I don't have a dog, but I can relate - my baby made my queen size bed feel tiny when she was just 9 months old! So sweet... and what a CUTE CUTE photo! @ casey: haha, yeh. this is my favorite picture of her ever. it's like 2 years old, but it's still awesome. @ erin: love the drama mama. @ fee: izzie rarely chews on things THANK GOODNESS!!! @ jannie: not leather, but stain treated. phew. @ chefdruck: haha, i bet! my 7mo can spread his wings the entire length of his crib!!! I totally got a lump in my throat from your post. Not to be a Debbie Downer...I just found out that the dog-love of my life has cancer. It's devastating. It's so wonderful to see how much you appreciate your 1st! What a lucky little guy!